Cut jeans on the inseam all the way around. Cut jeans to the length you prefer it is always better to cut less at first and cut it shorter after you try it on. Sew the left and right sides of the front of the jeans together. Turn over and sew the back two parts of the legs together. You will want to sew in a straight line rather than following the shape of the fabric. After you have sewn it together try it on and make sure you do not have to make any adjustments. 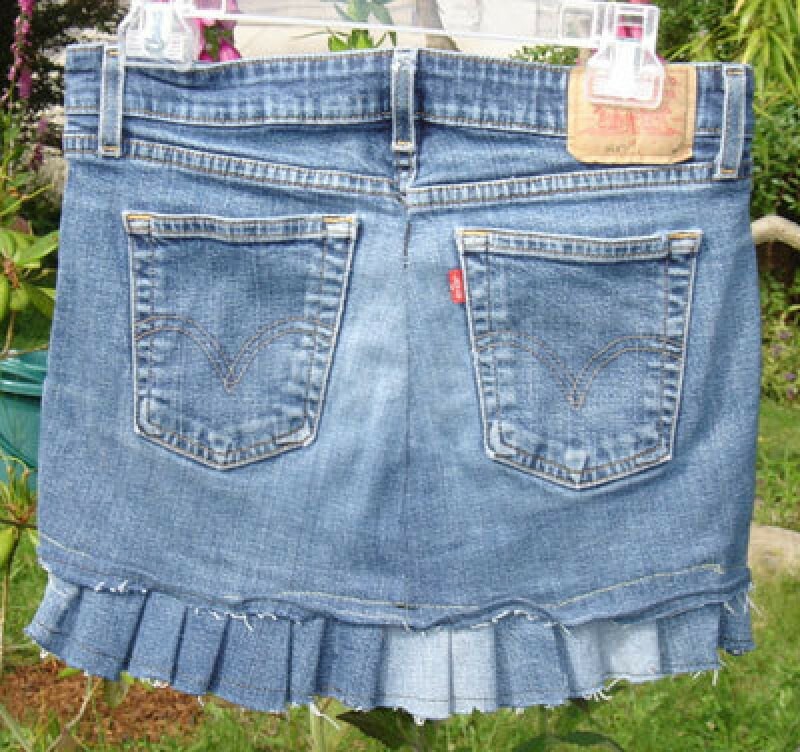 If everything is okay then cut off the excess fabric inside the skirt. Fold up quarter inch of fabric from the bottom, pin and sew a hem. Cut long strips of jean fabric about 2 inches wide. You will need to sew a few long strips together, this needs to be much longer that the diameter of the bottom of the skirt. You will use this for the ruffle. Start at one end of the strip on fabric and place it on the inside of the skirt about a half inch in. Sew about one inch then fold over part of the strip and sew over the fold continue to do this for all the way around the bottom of the skirt. You do not have to make this uniform, just fold over when you want to. I always folded when I hit the seam from sewing parts of the strip together so it would be hidden. I kept the end of the ruffle with out a hem, to prevent it from fraying too much I sewed a straight stitch all the way around the bottom. Editor's Note: The distressed look is very popular with young folks. 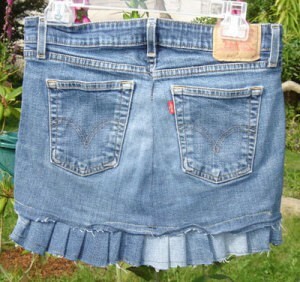 This skirt definitely has that distressed look and is a fun and easy project for your budding clothes designers. I did the same thing with a pair of jeans that were way too large. Had to take in the waistband in addition. I still makes these a couple times each year for my church family and my best of friends.You can use any size or color denim you like,thenI cut from from around the knees,leaving the bottom already to work with cause it had been hemed.I cut 2 short pieces of demin then hemmed them and sew or glue them together .Now you will have something to neatly store you plastic bags in for safe keep.I sometimes sewbuttons on front and anything that has a little bling to it.I now will be saving my denim again for all of these ideals you yall have sent in. I am so happy to have found this site and joined it.Thanks to all. I have tacked a pair of soft fabric shorts to the inside of the skirt and having wonderful colors of lace, have layered them, created visions of art, all with finished seam work. As one who has sewn since about age 7, we were taught not to leave an unfinished edge, tacky, so many things available in fabric shops to use to finish. I like picking up stretch denim jeans at garage sales, open them up and use a regular pattern and create as well.